Time to make some bad decisions! 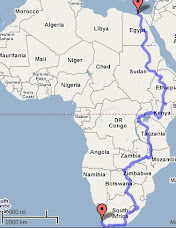 In July and August 2008, we are riding our motorcycles from Cairo to Cape Town. We'll be writing about our trip and its preparations here. Stay in touch and keep looking ahead. We are raising money for Spread the Net, a great organization combatting malaria. Please donate here. We are quite happy to announce that Alpinestars -- the great motorcycle boot manufacturer -- have agreed to sponsor our trip. They'll be giving us two pairs of Tech 6 boots, and we'll be doing our best to see whether they are up to the test. I imagine we'll be glad to wear them when we're spilling on the lava rock road between Moyale and Nairobi. Posted by Peter Loewen at 5:54 p.m.